Worldwide, May 1st is traditionally a workers day – a day of labor solidarity and a public holiday. It’s a day to celebrate and march in support of immigrant rights, worker rights, and human rights. 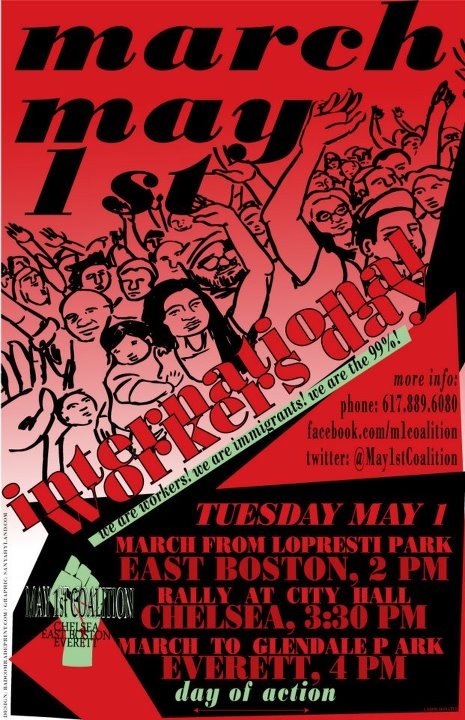 In protest against the corruption of the worldwide marketplace, which has led to illegal foreclosures, mass unemployment, low wages, high taxes and a penalization of all those who do not own the ‘99%’ of the world’s resources, and in solidarity with the immigrant movements of Massachusetts and the world, Occupy Boston is calling for a general strike on May Day. Take the day off. Strike. Call out sick. Small businesses are encouraged to close for the day and join the rest of the 99% in the streets. If you must work – don’t worry – we have actions planned from 7:00am to 8:00pm. Walk out of class. Occupy the universities. Kick out the administration. Participate in student strike actions or plan your own. It’s your future. Own it. In the early hours of May 1st, the 99% will converge on Boston’s financial district for a full day of direct action. The “Financial District Block Party” will start at 7:00 am on the corner of Federal & Franklin Streets. Banks and corporations are strongly encouraged to close down for the day. We ask the 99% to organize in their own neighborhoods, schools, and local centers of commerce. Communities, organizations, workplaces and families are encouraged to organize actions in whatever manner feels comfortable. Picket a “too big to fail” bank in your area. Hold a protest picnic in your town square. You are the one you’ve been waiting for! We call upon all of the 99% to join in this day of action to demand an end to corporate rule and a shift of power to the people. No work. No school. No chores. No shopping. No banking. Let’s show the 1% that we have the power. Let’s show the world a day without the 99%. 7:00 AM – Financial District Block Party: Meet at the intersection of Federal & Franklin Streets in downtown Boston. Participate as a mourner (dress in black), a celebrator (wear neon/bright colors/glow stuff) or be part of the skeleton bloc. Leaves from Copley Square and travels through areas of wealth and commerce. 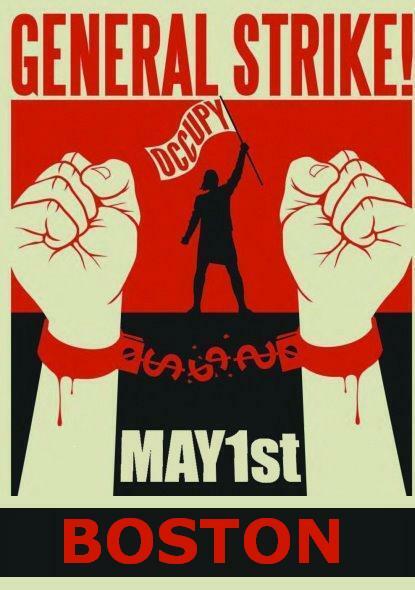 Occupy May First – General Strike!